This guide provides a broad outline of the resources available at the Modern Records Centre to research the history and politics of the anarchist, syndicalist and libertarian movements - from the 1886 trial of the Chicago anarchists to the punk explosion, 'Class War' and riots of the 1970s and 1980s. It is divided into two sections: 'Sources from the 1880s-1950s' and 'Sources from 1960 onwards'. Our online catalogue can also be used to search for key terms or particular collections. Information about sources for the Spanish Civil War is included in a separate guide to sources. Publications issued by Guy A. Aldred, including: 'The Herald of Revolt and Synthetical Iconoclast', vol.1, no.1, 5 Oct 1907 [MSS.15X/1/101/1], 'The Herald of Revolt', vol.1, no.1 - vol.4, no.5, Dec 1910-May 1914 [MSS.15X/1/102/1]; 'The Spur', vol.1, no.1 - vol.7, no.8, Jun 1914-Apr 1921 [MSS.15X/1/296/1-2]; 'The Red Commune', vol.1, no.1, Feb 1921 [MSS.15B/7/29]; 'The Commune', vol.1, nos.8-12, vol.2, nos.3 & 9-12, Feb 1924-Aug 1925 [MSS.15B/7/30]; 'The New Spur', vol.1, nos.1-5, Dec 1933-Apr 1934 [MSS.15X/1/204/1-5]; 'The Socialist May Special', May 1934 [MSS.15B/7/31]; 'The United Socialist', Oct 1934, [MSS.15B/7/32]; Glasgow Municipal Election address, 1934 [MSS.15B/7/33]; 'The Attack', vol.1, no.1, May 1936 [MSS.15B/7/34]; 'Regeneracion! ', vol.1, nos. 1 & 3 (new series), 21 Feb 1937, 7 Mar 1937 [MSS.15X/1/252/1-2]; 'News From Spain', vol.1, no.1, 1 May 1937 [MSS.15X/1/210/1]; Hyde Park, vol.1, no.1, Sep 1938 [MSS.15B/7/35]; incomplete series of 'The Word', 1938-1945, 1951-1961 [MSS.15B/7/36 and MSS.15X/1/320/1-5]; examples of pamphlets from Strickland Press / Bakunin Press / Guy A. Aldred, 1907-1948 [MSS.15X/2/490/1-26]. Other British anarchist publications: 'The Libertarian', bulletin of the North East London Anarchist Group, vol.2, no.4, Apr-May 1954 [MSS.15X/1/160/1]. US anarchist publications: 'Why? ', anarchist bulletin published in New York, vol.4, nos.7-8, and vol.5, nos.4, 6-8 & 11, 1945-1947 [MSS.15X/1/317/1-2]; 'Resistance', anarchist monthly published in New York (renamed version of 'Why? '), vol.6, nos. 3 & 6-9, vol.7, nos. 1 & 4 and vol.8, nos.1-4, 1947-1950 [MSS.15X/1/253/1-3]; two pamphlets from Mother Earth Publishing Association - Emma Goldman, 'What I believe', Undated [post 1908] [MSS.15X/2/310/1], and Emma Goldman, 'Anarchism: What it really stands for', 1916 [MSS.15X/2/310/2]. 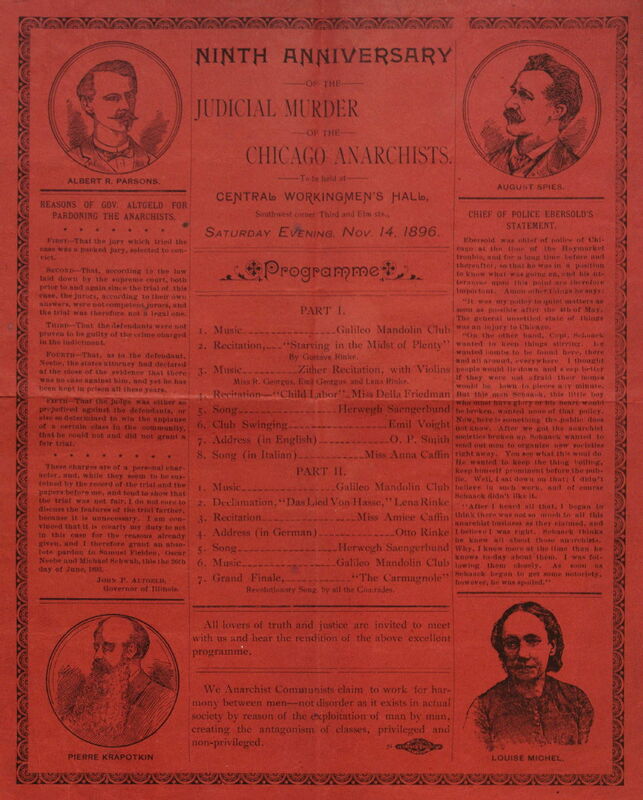 Includes: leaflets commemorating the 1886 trial of the Chicago anarchists, 1887-1896 [MSS.240W/3/6]; 'Freedom', anarchist journal, Nov 1896, May 1900, Jun-Jul 1905 [MSS.240W/4/1/6]; file on the 1887 autobiography of August Spies, American anarchist, who was executed in 1887 as a result of the Haymarket Square disturbances in Chicago the previous year [MSS.240W/4/2/5]; 'Michael Bakunin - a biography', pamphlet in Yiddish published by the Leeds Anarchist Group, 1902 [MSS.240W/4/6/23]; and correspondence with and publications by Peter Kropotkin. Included in the archives of Tom Mann: publication of 'The famous speeches of the eight Chicago anarchists in court', by Lucy Parsons,  [MSS.334/5/MIS/2]. Included in the papers of H.E. Edmonds regarding Victor Grayson and Tom Mann: 'The Industrial Syndicalist', vol.1, nos. 1, 5 & 9-11, 1910-1911 [574/P/1]. Includes: correspondence (in German and Italian) with Italian trade union leaders on anarchist-Syndicalist infiltration and strike attempts, 1913-1915 [MSS.159/3/B/99]; correspondence (in Dutch) with International Syndicalist Bureau on right-wing terrorist activities in Spain, 1921 [MSS.159/3/C/147]; 'Naissance A Paris de la Fédération Syndicale Mondiale', congress review in French, 1945 [MSS.159/5/2/130]; 'Theory and Solutions of Spanish Syndicalism' by F. Sanz Orrio, 1950 [MSS.159/5/3/998]. Includes: 'Freedom', vol.XLI, no.445, Sep-Oct 1927, published in London - many of the articles relate to the execution of the anarchists Nicola Sacco and Bartolomeo Vanzetti in Boston, Massachusetts, USA [MSS.149/2/1/1]; and issues of publications edited by the British anarchist communist Guy Aldred - 'The Commune', second series, vol.II, no.7, "A journal of anti-parliamentary communism", Nov 1927 [MSS.149/2/1/2]; 'Regeneracion! ', vol.1, no.1 (new series), "Organ of the United Socialist Movement, upholding and extending the Workers' Revolution in Spain, and unfurling the banner of the CNT-FAI", 21 Feb 1937 [MSS.149/2/1/5]; 'Barcelona Bulletin', 15 May 1937 [MSS.149/2/1/6]; and 'The Word', 1956-7, 1960-3 [MSS.149/2/12/15/1-6]. Includes: file on 'Spanish Political Situation, 1934', which contains a report on 'The part played by the Anarchists and Syndicalists in the Spanish Revolution, October 1934' [MSS.292/946/9]; file on 'Political prisoners in USA', (1917)-1960, which contains illustrated leaflet regarding Calogero Greco and Donato Carillo, anti-fascists and anarchists, 1927 [MSS.292/973/38]; and file on 'Prisoners in Russia', 1924-1927, which includes a circular from the Sacco-Vanzetti Defence Committee, Boston, Mass., USA, 1925 [MSS.292/947/39]. Sir Ernest Benn was the first President of the Society of Individualists, a libertarian organisation with supporters largely drawn from the "individualistic" wing of the Liberal Party. His archives include a series of documents relating to the Society of Individualists and the National League for Freedom, 1943-1952 [MSS.257/6/SI/1-7], together with publications by Benn on various libertarian / anti-state issues. Includes annual collections of articles from the anarchist weekly 'Freedom' for the years 1952-3, 1955-1960, and 1962-1964 [758/2/1/1-11]. This collection includes examples of approximately 100 different national and local anarchist and anarcho-syndicalist journals and magazines, mostly from the 1970s and 1980s, including incomplete runs of 'Anarchy', 'Black Flag', 'Class War', 'Freedom' and 'Outta Control'. It also includes examples of anarchist pamphlets, "alternative" magazines and locally produced post-punk fanzines from a similar date. Includes 50 issues of 'Anarchy', 1961-1966, "a journal of anarchist ideas" published by Freedom Press, London [MSS.244/5/1/1-50]. Includes: 26 issues of 'Anarchy', 1961-1970, "a journal of anarchist ideas" published by Freedom Press, London [MSS.15X/1/12/1-26]; 'Fifth Estate', 1977-1979, anarchist newspaper published in Detroit, USA [MSS.15X/1/80/1]; 'Zero', nos.1-7, 1977-1978, Anarchist / Anarcha-feminist monthly "produced by a mixed collective mainly from East London" [MSS.15X/1/345/1-7]. Les Prince collection of ephemera, principally covering anarchist, libertarian and left-wing organisations, printing trade unions and pressure groups, 1964 - 1986 [MSS.21/1655]. 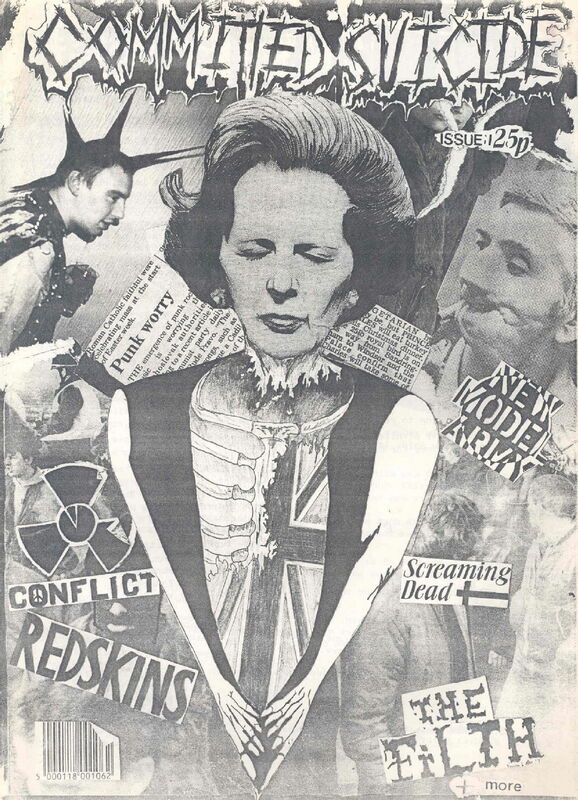 Andrew Whitehead collection of material re pro-abortion movement, anarchist and left-wing movements: Journals, bulletins, leaflets and other published material from the 1970s-1980s [MSS.21/1538/1-406]. Syndicalist Workers' Federation: Direct Action Pamphlets, [1960s] [MSS.21/3451-3458].